Well, the good news is not that there was a Swearing-In of President Museveni for his Seventh Term, bite me, it is not fifth, it’s Seventh! Got to teach the National Resistance Movement to count, after that the international media some recent history to not shave off the first decade in Power for Mr. Yoweri in Uganda. “Department spokeswoman Elizabeth Trudeau said U.S. Ambassador to Uganda Deborah Malac and a visiting Washington-based official, along with several European and Canadian diplomats, abruptly left the inauguration after Museveni made negative remarks about the International Criminal Court in his inaugural address. She added that the U.S. also objected to Sudanese President Omar al-Bashir’s participation in the inauguration. Al-Bashir has been charged by the court for atrocities in Sudan’s western Darfur region” (Lee, 2016). Because this set the perimeter of next inaugurations as Uganda is not the only country where the Opposition is under fire and where the human rights are squabbled for the Ruling Regime to control. But the reaction from the European Union representative and the United States is a bit late now. United States Government have supported them the Ugandan Government for three decades as the Ugandans have fought wars you wouldn’t touch with a your little finger. The European Union have done so in good faith and with the hopes that this will be one of their success stories as the beginning of Museveni terms he was actually sounding like a democratic ruler and had swagger like no-one else and even swallowed the Structural Adjustment Program; more than many other leaders did for long-term loans and direct-budget aid to the Ugandan government. But that is not why the diplomates left the Inauguration of President Museveni at the Kololo Independence ground. They left the event in midst of the speech and everything because of mentioning of International Criminal Court, the discontent that exist in certain parts of Africa, as the ICC have target many African leaders and Warlords, while nearly none of the allies of European or American Government have been taken. Which make it seem like Post-Colonial tool and certain totalitarian, and Police State leaders feels that especially since they might be the next in line to be charged by the ICC. Even on the second Live Presidential Candidate or the second #UGDebate President: “A founding signatory of the Rome Statute, on ICC: Yes we should be out of the ICC. ICC is not serious. It is partisan. There are so many people who should have been tried if they were serious. The way to go is to have our own African Criminal Court. Trying to work with ICC was a mistake”. So if the American or European diplomats were surprised by the words uttered by the President, they should check his track-record, and are you naïve? He is the same brother who toyed with the worlds in the Nairobi talks in 1980s, muffled the involvement in Rwandan Patriotic Front, the direct involvement in wars in Democratic Republic Congo that got rid of both President Mobutu Sese Seko and President Laurent Kabila. His involvement in South Sudan and also the claimed help of President Nkurunziza after the coup d’état in 2015; there are too many instances where he has went to the gun for himself and others. So that he dislikes the ICC should be seen as natural for his Western Allies, that have given military experts and equipment over decades. He used ties to Libya to get arms to bring down Obote, Obote whom he had a agreement with to get rid of Idi Amin. This man has done whatever to get power and get powers other places. He is ruthless and does not care how far he has to go to have it. He builds people up and burry them if they get ambition. So many men have fallen and so many fallen without the reason or the authorities have cleared the cases of the killings. Many men who have had honorable positions and been high up in the military have been silenced by the NRA/NRM. And this isn’t just rumors, this is known, but not something that is talked about. So European diplomates and American ones, you have to consider your obligation and role in Uganda, the walkout and the assessment of that, is only a small embarrassment, but to cut donor-aid and military equipment would mean something. To endorse directly Dr. Kizza Besigye would be another force of change. That would be like Alassane Ouattara won over Laurent Gbabgo in Cote d’Ivoire in 2010. Who made his own army and took over power when the International Community recognized Ouattara in 2011 and later detained Ggabo. So there are possible ways of creating the changes, but hopefully without guns though that is the only thing President Museveni believes in. I know he told at one point he wanted to be a Pastor, but over the time he became a gun-loving, bush-war and embezzlement patriarch who oppose the idea of any other human being having a vision of leadership in the country he is running. “After introducing ICC indictee Bashir, Museveni said: “We lost interest in the ICC. We thought they were serious.” Museveni said he had supported ICC at the beginning but realised that “ICC is a bunch of useless people” (Trending.co.ug, 2016). This words uttered from the mouth apparently was too much from the Western Diplomates today. Together with them we’re also the invited and warranted President Bashir; for me some strange reason no problem with the other hectic and problematic despots, dictators, lingering Presidents and so on; that also showed-up for the event. Why no problem with Cameroonian Biya? Why no problem with President Obiang? Why not mad about President Mugabe? And list goes on of people who disrespect democratic values and freedoms in their countries… though not sanctioned by the ICC. For being diplomates, they should have known at least about the words said by the man on the Presidential Debate in February 2016. The ICC has already issues within the African Nations and the African Union have had talks on removing itself from the International Criminal Courts because of Post-Colonial affairs and targeting African leaders. So with that in mind, this doesn’t help the cause for the Europeans or Americans unless they do something serious, a ruthless man like President Museveni. Needs the guns and equipment, if not he trade with Russians and trains together with North Koreans, he has done it before and will do it again. Even order second level army equipment from China instead of getting training and army deals with Americans. The Western diplomats should not be surprised and should know his history and how reckless he can behave. Why do you think Hon. Paolo Muwanga even feared and was disgusted with the man? He even understood to what extend the President would go when he got into power. Since he spoke beautiful words as it was needed in the Bush, the people and international community supported him. Now there a long run since 1986, lots of European and United States Presidents have been in Power and changed leadership, while the Ugandan leader have lingered on and not caught flack before now, really? Late to the Party or is it the later redeemer now? The issue is that they have known he has these sentiments, as the escalated violence, detaining and use of army against his own citizens. We can see it with the recent Post-Election killings in Kasese, the pro-longed Northern Uganda Conflict that lasted since 1980s into peace agreement in 2006; and the Ugandan-Fueled guerrillas in the DR Congo. So that he is a little rash and rough with the introduction of President Bashir is the issue all of sudden, is sorry to say a little weak tea as you have given way for him to do all the other activities and not really condemn that. This because President Museveni have been a needed ally in the region after the fall of Mobutu, that American Government had for so long; that is why President Clinton even praised Museveni together with other leaders. Today should not be surprising, the European and American Diplomates should have known his sentiments on the ICC, and he want to be a great leader, so he would invite anyone who wanted to show-up. This here is just the proof of it, nobody expected President Obama or Chancellor Merkel or even President Hollande to attend: They would rather have a cup of tea then showing-up. The strangest was that the former loyal ally President Kagame was in the wind… but that just so the strained relationship. Well, this was my two cents. Not beautiful… just the way it is; when you have trusted a man to fight for you and expecting him to be peace loving democratic values full of integrity and standing by for liberty and justice in his Nation, while they have for decades let him get away with murders, destabilizing neighbor countries and done other adventures without giving him much of even a slap on his face. Then you expect him to be the grandest man… you have lost the plot fellow Western Diplomates. Peace. I write to you since in the recent day you got rejected to meet with the American President Barrack Obama who will visit Kenya on the 24. July 2015. This is today! And he wouldn’t meet you in Kenya! It must be a slap on your face Mzee that your ally in America is saying “no to see you”. When he is in your neighborhood. When he steps on land in East African Community and will not see you. Your sending troops for them into Central African Republic on the goose hunt for your lost cause for so long in Northern Uganda. The famous LRA and Joseph Kony! The one man that even the American army want to get rid-off! Then they failed together with Ethiopia in Somalia where you have been charged together to fight Al-Shabab. The Americans are certainly happy that you do this and don’t cost them much compared to send their own troops. Mzee there many reasons why President Barrack Obama is saying no to see you. He is firstly meeting Kenyan president Uhuru Kenyatta. Who is turning into Americans ally in the area of late, even if you fight wars for them and use enormous levels of resources as well, still he doesn’t expect your courtesy call. You have been in charge of Uganda since October 1986. Obama is in his last term he has been lucky to only be Head of State in the country from 2009. He is not like you a true and tested leader like you! Even if he has Nobel Peace Prize. He got before really stepping into the office. He has also been parts of wars. You have sent your own people and now they don’t even talk to you. I am not sure is because you have latest visits abroad to any great western powers. Was to Russia and then you started to buy army equipment from them instead of American. That is sure a slap to the face or the U.S. Arms producers, the cancelling of a planned military exercises on the 19. June of 2014, because of the “Anti-Gay Bill”! Since then it’s been cold from the American government and the White House. Then you’re buying expensive military equipment for your army from Mzee Putin of Russia. It’s okay that Obama had a burger with his predecessor Medvedev. Still with the Ukraine situation and Putin back in the hot-seat the turning relationship has also hit a snag. So don’t get the possibility to eat a burger in Nairobi with Obama. So you’re now hurt by the almighty Obama. I am sure you wished yourself was directly mediating in Burundi, instead of the Defense Minister Crispus Kiyonga. You’re in Uganda dealing with your own election then being there looking good for the press. The sad thing for you is to see your former weapon brothers going against you like Jean Patrick Amama Mbabazi. Who is trying to take your candidacy in your own party the NRM! And even worse for you is that the man who has fought against you for so long Dr. Kizza Besigye has gotten crowds where-ever he steps and moves around in the country. And your methods of chasing the opposition like a headless chickens, don’t help you at all Mzee Museveni. You think it does, but up to the election, you just look foolish to all the pundits. You look like a weak man instead of the man who has been in power since the 80s. You have cut loose so many big men before going into power, like Gen. Oyite Ojok, Yusuf Lule, Tito Okello, Milton Obote and Idi Amin. Before that the country was in shambles and you have made in some kind of peace. You could have been a hero! If you had left after your two first terms then you have been left with a decent legacy. That’s would have been since you gave the country a constitution and peace nearly on all places. You struggled with the Northern Uganda. And still continue to pay back to SPLM and South Sudan because of their help in the area. This is not popular that for the U.S. that your involved there without an official mandate. 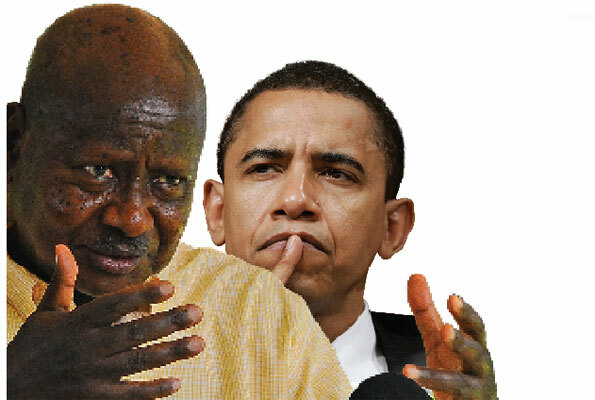 I am sure that there are more issues for why Barrack Obama isn’t in your presence right now Mzee Museveni. So you are not the poster-boy and future leaders of Africa in 80s and beginning of the 90s. Where you and Kagame your former allies was seen a breath of fresh air! Now you are not the one who the west looks for hope in the continent. And you wonder why? That is because history repeat itself and you have broken your own words time and time again. I am sure it’s been fun to have over the President of Zambia Edgar Lungu. But that is no Barrack Obama and with the power of U.S. And he could help you with military equipment. Though they not doing business as the Russians and taking pieces of the future oil industry instead of money. So I am sure that hurt your pride Mr. President. But know that the party has still fractions that are loyal to you because you pay them. The leaders who showed you support after last election victory was President Mugabe of Zimbabwe, former Kenyan President Daniel Arap-Moi, the now former Kenyan President Mwai Kibaki, Deputy Prime Minister Uhuru Kenyatta, President of South Sudan Salva Kiir and the Somali President Sheik Sharif Sheik. But none of this can help you as the American President and honor your presence. You have run a country as long as I have lived. And to get turned down and spend time with newcomer from Zambia must be low-key moment for you. Since you have been so useful to the American government and fought the wars they don’t want to. I am sure you’re having a bad day. Though not saying it since your hurt and parts of you might wish you didn’t visit Russia last time. And you should have tried to mend up with Americans who has supported you through the 90s and 00s. That refinery has cost you and the pipeline for the oil has been dodgy as well. But you’re so close and just need another term to the Lake Albert becoming your black gold. Until then you just has to use the well-used methods of keeping people in order and follow the party line. Though this doesn’t help you with your relationship with the American Government unless you break your principle and rules. Which is sacred to you and that is understandable. The American president only has eight years to do his thing and then he is gone. You have sit eight years in power when it was 1994. By then you we’re support Kagame and the RPA in Rwanda. So the issues with America should go over. You have their old weapons and know how they call on you when they wars they don’t want to fight. So your not best buddies today, but maybe during next term if their getting a republican president in the White House he might support you, because he will only care about policy, not about who as long as he looks good during the whole deal. Tomorrow is another day Mr. President His Excellency Yoweri Kaguta Museveni! You will shine again. Believe that and by now your mustard seed should be a big plant and give a good yield. Though Dr. Kizza Besigye is stealing your crops, don’t worry people will vote for you, even if they don’t know they do! The Electoral Commission is your people, you’re safe and good. You just have to wait until the U.S. need you again. Then you will get granted to meet with the Nobel man himself. Maybe even in your own Statehouse in Entebbe. There is reports you get a courtesy call in Ethiopia, but for a great man like you that feels like you been snubbed twice already by the American President. I am sure your hurt and tried to patch up the hurt with a meeting with the Zambian President to be the big shot in East Africa. While your neighbors president get him directly for visits. Uhuru Kenyatta the Kenyan President and also meeting with Hailemariam Desalegn Boshe the Prime Minister of Ethiopia in their homelands. While you have travel to Addis Ababa to see him for a short time and not an official visit like they are getting. And you have been their ally for decades and when they’re in your area they don’t show you respect you deserve. For God and for country!